This past weekend I was able to completely surprise Tom, and it was so much fun! A few months ago I joined “Groupon“. You may have heard of it, but in case you haven’t, it’s a free e-mail list you sign up for in order to receive a daily coupon for all sorts of things in your area. Click here to read The Orlando Sentinel’s article about it. One in particular that caught my attention came from Adventures in Florida. 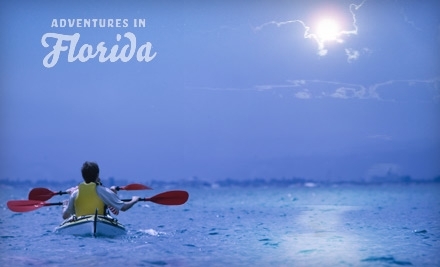 They offer a kayak trip on Lake Maitland when the moon is full. I purchased a ticket for the two of us at half the price, and it included all we would need for the 3 hour trip. We arrived at Fort Maitland at 7p. to discover about 24 people also cashing in on the Groupon deal. There was one couple we met who were celebrating their 25th anniversary. They shared how they had also used a Groupon deal to go to dinner before the kayak excursion. If you live in a larger city, check Groupon out to see if it’s available in your market. Lots of great deals. Anyway, back to our evening. 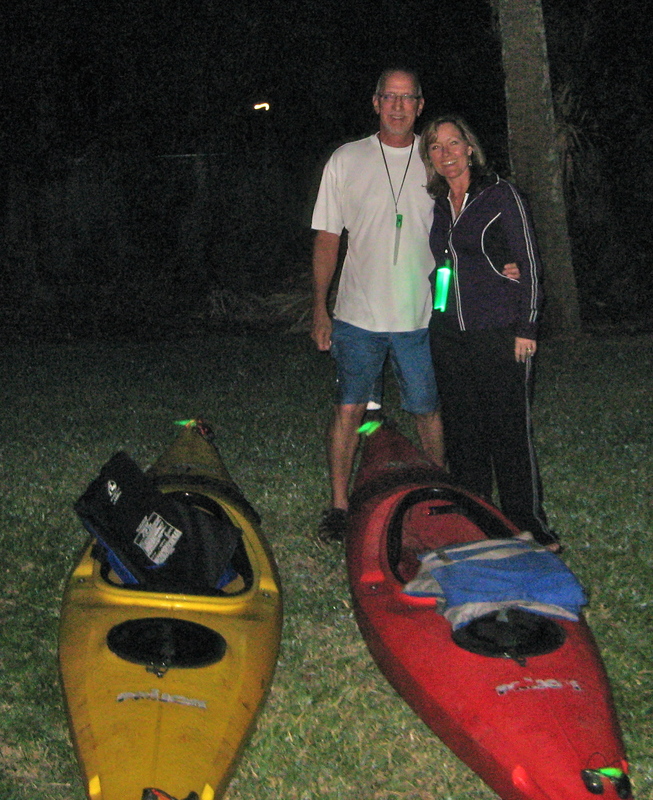 We tied glow sticks to the front and back of our kayak – Tom and I each had our own kayak and we also had a handy glow stick/flashlight around our necks. We jokingly said all these lights made the lake look like a landing strip. Fortunately, no sea planes showed up! Life jackets on and paddles in hand, we were launched into the lake! It didn’t take long until we had the hang of it – neither of us have ever kayaked before, but I have a feeling we will again. As we waited for the rest of the group to launch, Tom called me over to where he was. As I paddled to him, quite effortlessly I might add, he pointed across the lake – and I was speechless. 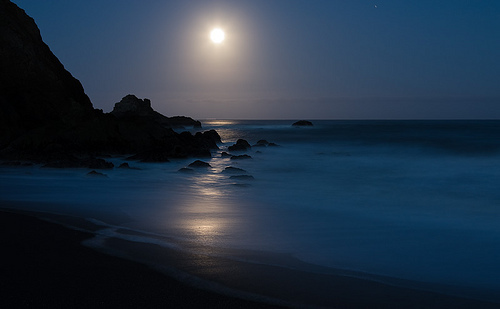 There, just rising over the far side of the lake, was the most beautiful full moon. Sitting there with Tom in the water was a memory I’ll never forget. In no time we were paddling quietly across the lake, through a narrow channel to a small piece of land called Dog Island. Here our guide had provided refreshments, a bonfire and live music. The lady singing had an amazing voice, which added to our enjoyment of it all. It was perfect weather for a night on the water. It was the perfect place to enjoy being together. My only regret is the lack of pictures I have, we were after all kayaking for the first time. But I’m happy to say no one flipped! This entry was posted in Date Night Ideas, Orlando Date Ideas, Outdoor Dates, Sunset Dates, Unique Dates and tagged Active Dates, Adventures in Florida. Bookmark the permalink. Awesome picture, awesome trip. So glad you enjoyed it, sounded so peaceful.